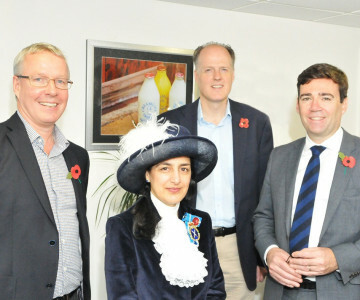 Last week marked an important milestone in our Glass Is Greener campaign, with Creamline welcoming the Mayor of Manchester, Andy Burnham, to our Trafford Park head office. Encouraging the people of Manchester to make the switch from single-use plastic to traditional glass milk bottles is something we’ve been passionate about here at Creamline for more than twenty years. The launch of Creamline’s ‘Glass is Greener’ environmental campaign has already seen over 10 million glass bottles delivered to homes and businesses across Greater Manchester in 2018 alone – saving a staggering 183 tonnes of plastic from local landfill. Looking to cement Greater Manchester as one of Europe’s leading green city regions, earlier this year, the Mayor announced his ambitions to improve the city’s efforts. Our Best of Local box scheme – in an effort to make our BoL range as environmentally friendly as possible, we launched our new box recycling scheme this year. Simply leave your Best of Local packaging out, ready for collection the next day. We’ll then recycle it for you! Our Plastic Pledge – Andy Burnham is aiming to ditch single-use plastics in Manchester completely by 2020. With the help of our green dolphin icon, we’re flagging to you the items across our range which are completely free from plastic packaging. It couldn’t be easier to reduce your usage! Commenting on the plastic initiatives, Mayor of Greater Manchester, Andy Burnham, said: “We want to make Greater Manchester one of the greenest city regions in Europe. But we’ll only achieve that if we work together and start to make some serious changes to the way we live our lives and do business together. “As public tolerance of plastics falls, people are looking for alternatives, which is good news for businesses like Creamline that are already making big adjustments to help deliver a cleaner, greener Greater Manchester. Want to be part of Creamline’s Glass Is Greener campaign? Make the switch from plastic to glass today! Sign up to glass deliveries HERE.